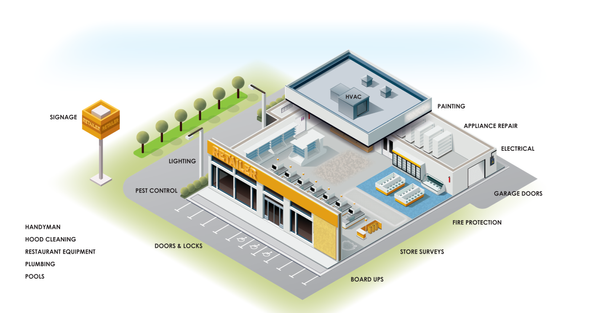 One of the most important factors of a successful business is strategic facilities maintenance. A solid maintenance strategy keeps the quality and appearance of commercial facilities intact, and communicates value to customers, tenants and business partners. SMS Assist is no stranger to the demands of facilities management. We’ve developed a facilities maintenance model that reduces costs while allowing your team to focus on core responsibilities and value-added strategic initiatives. To address each of these requirements as effectively and efficiently as possible, you need a knowledgeable partner that provides facilities maintenance services and total visibility into your maintenance strategies. Strategic facilities maintenance puts the processes in place to respond to proactive and reactive maintenance needs. You need a solution that eliminates complexity and results in speedy work order resolution. That’s where SMS Assist comes in. Affiliates are available 24/7 to respond to emergency requests including HVAC, plumbing, electrical, roofing and more. Tap into SMS Assist’s professional network for regular services including pest control, trap cleaning and preventative HVAC maintenance. Moving beyond basic repair and maintenance services, Affiliates specialize in pools, garage doors, water extraction, concrete/masonry and more. SMS Assist’s business model is unrivaled. Our solution allows property managers to seamlessly manage maintenance operations from start to finish. into spend, quality assurance and service verification. through a unique business model that drives cost efficiencies and eliminates over-the-top maintenance expenses. and a nationwide team covering every step from work order creation to vendor payment. protecting you from claim-related incidents. and operations specialists to ensure experienced professionals are dispatched to handle maintenance tasks. Better facilities maintenance starts here.